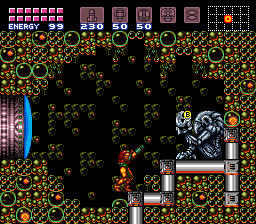 Samus will be able to collect an item which lets her shoot charged beams at a very fast rate, at the cost of 1 power bomb. This item is a replacement to the X-ray scope. Credits to Person701 for the original ASM, SMILEUser96 for some help, and Tedicles for the item GFX. I did the HUD GFX and parts of the code. When Scyzer fixes the message box editor, I may fix the message box as it still tells the user to hold the Run button. Simple, but effective. Highly recommend. Very nice substitute for the X ray scope, adds a new level of depth to combat. Really good replacement for the X ray scope. I only used this because the X ray scope crashed a certain screen in my hack but I'd recommend it for anything. It really makes combat a lot more interesting. This is a lot of fun to add to randomizers or various mods, especially when you already memorized where all the items are. Its also fairly unobtrusive allowing it to be stacked with many ASM patches. However there is a bug when you empty your powerbombs the item auto clicks off. however nothing is stopping you from reselecting it and using it again. This causes your powerbombs to underflow, granting you near infinite of them and also disabling use of powerbombs until you are under a certain amount of ammo, sometimes causing a soft lock if you are in a bad location. If it had something to prevent the selection when you had insufficient ammo, i would likely use it more and rate it higher.